Shinji’s Japanese class week 1. Welcome to Shinji Ikari’s Japanese class!! Ok, here we go! I am going to do these threads for people who want to learn Japanese reading, writing, and speaking. You can learn as much or as little as you want. I hope to make each lesson like this. Handwriting pictures, and voice clips from me will be posted sometimes so you can see and hear what I am writing and how things should sound. Taking notes will help as will LOTS of index cards!! I will only be using Hiragana to start. Hirigana is the first Japanese alphabet children learn in Japan. Here is a link to a good chart. It has sounds too. You do not have to learn Hiragana to keep up, but some of you will, so I shall show you the way!! Each new word should be written on one side of an index card, and the English meaning on the other. Keep one or 2 cards in your pocket and pull it out throughout the course of the day. You will learn fast like this! It is what I do. I will give 5 new hiragana every week fo rthose who want to learn them. I reccomend keeping a small notebook and write each symbol SLOWLY, fill a page with one symbol, repeating the sound every time you write it. 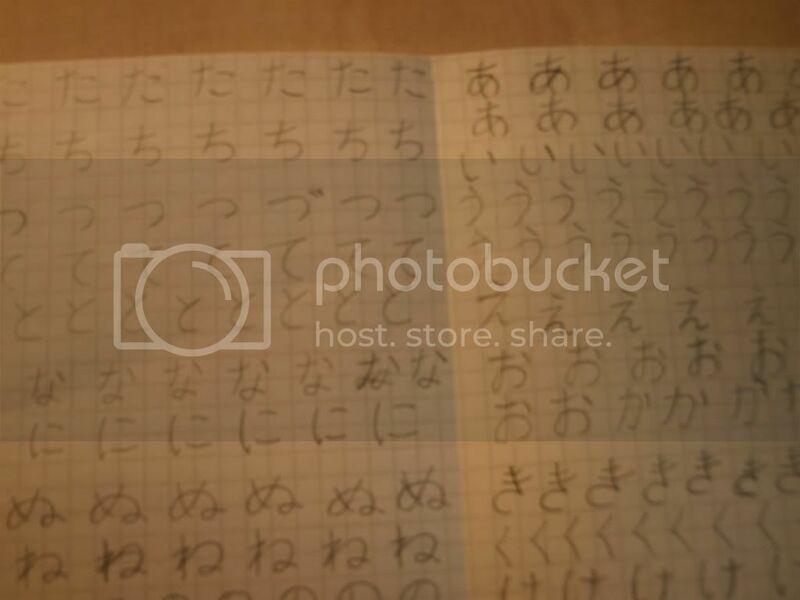 You can easily memorise 5 hiragana each week like this! AND, you will know how to write some proper Japanese!! 1. Romanji (the regular letters I am typing with now) is not proper Japanese spelling. 3. When conversing in Japanese, you always speak humbly, and be polite and as respectfull as possible. You always speak to/of others as if they were more important than you, and speak humbly of yourself. 5. A lot of words do not have a direct english translation. ok ok ok many times haha! I can't type in Japanese on this pc but I won't let that get me down. Now I'm supposed to write from right to left, right?? see if you can translate THAT! ようろっぱにすんでいます・・・are you trying to say you are from europe, or are european? ok, my eyes hurt.... nice try though! that's how you learn! Amiira is the japanese form of my name. i'm both, european and come from europe. What is the most difficult is turning english into romanji. Check out the link to the chart i gave Katsu.. It has all of the hiragana and if you click on one, it gives a sample of how it is pronounced..